This is a program for superior students with master’s degrees in civil engineering or allied fields who wish to do advanced research in an area of civil engineering. In exceptional circumstances, highly qualified students with bachelor’s degrees in civil engineering may be accepted directly into the doctoral program. A minimum master’s GPA of 3.5 on a 4.0 scale, or equivalent, is normally required for admission. The GRE (general section) is required of all applicants with a minimum 155 in the quantitative section. All international students must also achieve a minimum TOEFL​ score 79 for the Internet-based exam, 213 for the computer-based exam, score of 550 for the paper-based exam. or a minimum score of 6.5 with no sub-score lower than 6.0 for the IELTS exam. The department approves specific degree requirements and dissertation topics on an individual basis. Students must attain a minimum overall GPA of 3.0. 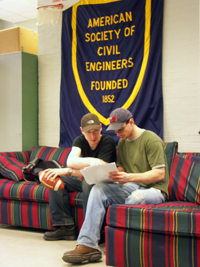 Students must conduct independent original research in a specific area of civil engineering. Students must select an advisor willing to supervise dissertation work. 36 credits minimum of CE 790 Doctoral Dissertation is generally required. These 36 credits should be completed before submission of the final dissertation document. Students must register for a minimum of 3 credits of CE 790 until the dissertation has been submitted and accepted. 24 credits minimum of course work beyond the master’s degree are required, of which at least 12 credits must be at the 700 level; the remaining credits may be at the 600 level. Seminar: CE 791 Graduate Seminar is required of all doctoral students every semester. Full-time students must take the preliminary qualifying exam for the first time within one year of beginning active study and must pass it completely by the next time the examination is offered. Part-time students must take the preliminary qualifying exam for the first time within three years of the beginning of active study and must pass it completely by the next time the examination is offered. Exceptional students having only bachelor’s degrees who are admitted directly into the doctoral program must take the preliminary qualifying examination within one and one-half years of admission and must pass it within two years. All students are permitted to take the examination only twice. After passing the preliminary qualifying examination, each student in consultation with the major faculty member develops a list of five faculty members who have agreed to serve on an advisory committee as follows: two or three members of the graduate faculty in the student’s major area of interest; a member of the graduate faculty in the student’s major area appointed by the department chairperson; a member of the graduate faculty of the Department of Civil and Environmental Engineering from another field of interest; a member of the graduate faculty from the area of the student’s minor field of interest. Doctoral students must prepare a written research proposal and make an oral presentation for approval by their dissertation committee. The proposal must be presented after formation of the committee but within six months after passing the qualifying examination. Research is expected to investigate or develop a unique contribution to science and technology. An oral defense of the dissertation is required after submission of the final document to the department for approval. Signatures of all members of the dissertation committee must be received for final approval to be granted. See a list of some of the ETD's in civil engineering.